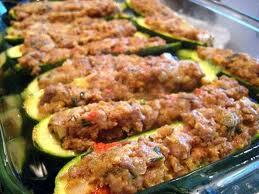 Stuffed Courgettes - Zucchine Ripiene ~ Sardinia Baby! Another great recipe from Nonna Peppa's Kitchen! Wash the courgettes and cut lengthways into two halves. Using a teaspoon gently scoop out the soft pulp from the centre and set aside. Fry the onion with a little olive oil until slightly golden. Add the soft pulp together with the minced meat and gently cook. Add salt to taste. When cooked let the mixture cool for approximately 10 minutes. Add the grated cheese and the egg and mix well. Wash the courgettes and cut lengthways into two halves. Using a teaspoon gently scoop out the soft pulp from the centre and set aside. Fry the onion with a little olive oil until slightly golden. Add the soft pulp to the pan and gently cook. When cooked let it cool for approximately 10 minutes. Add the egg and the bread previously soaked in a little warm milk. Mix together. The mixture will already be quite sweet but those with a sweet tooth can add a tablespoon of sugar. Same as above but the minced meat should be replaced by sweetcorn (2 tablespoons or more according to taste) and 2 finely chopped carrots. Cook together with the Courgette pulp. Instead of grated parmesan add finely chopped “Dolce Sardo” (or gruyere).